I took this macro shot in July, when we went for a walk in a protected meadow nearby. Humuhumu was so careful with this ladybird, cupping it gently in her hands on its tuft of grass seed and then placing it back on a leaf when she was finished looking at it. This entry was originally posted at http://nanila.dreamwidth.org/1057190.html. The titration count is at .0 pKa. Great shot! 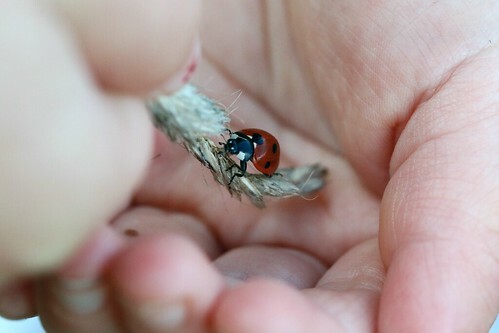 Pretty insect in cute little hands!